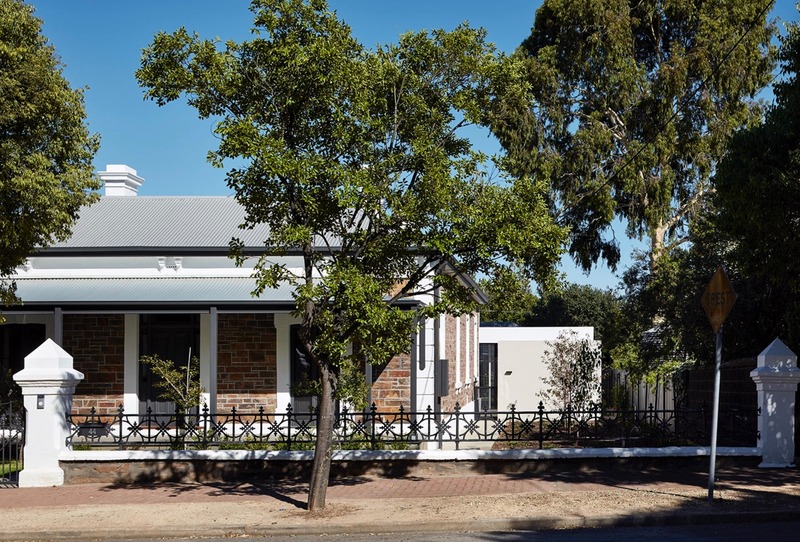 This contemporary style home was recently completed by adding a modern pavilion-style extension to an unkempt Victorian bluestone villa in need of rejuvenation. Completed in 2017, Architects Ink threw in an additional 175 square-meter pavilion to the existing 220 square-meters. The pavilion stands as its own separate unite, all the while respecting the legacy of the original villa it stands by. 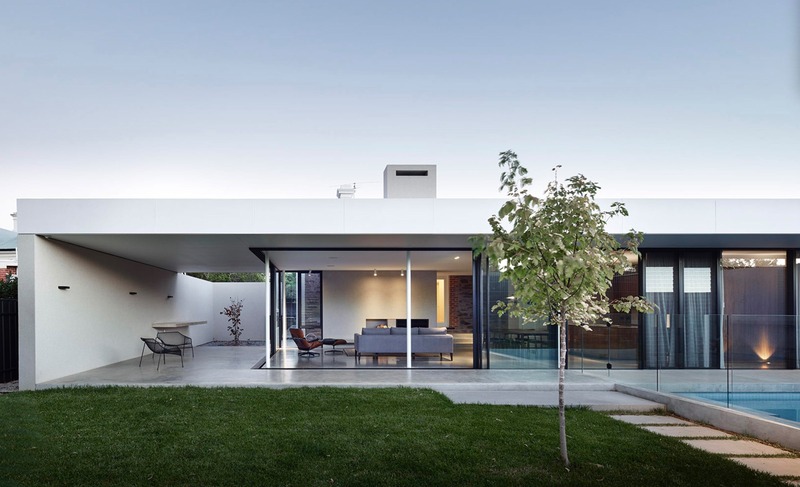 Leaning heavily on the use of horizontal lines, from the flat roof to the angles of the interior such as cabinets, shelves and minimal profile sliding doors, the pavilion boasts a spacious open-plan design including kitchen and family living space. 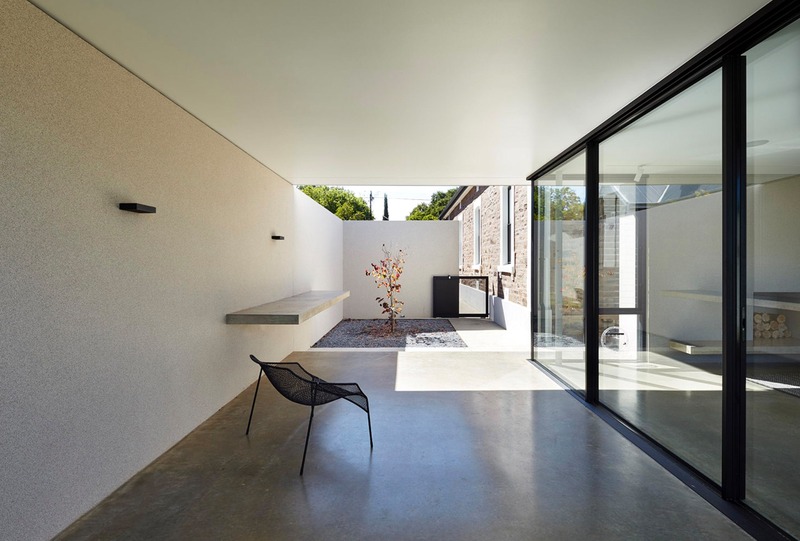 An outdoor space runs along inside living room, creating an L-shape adjacent to the indoor areas. 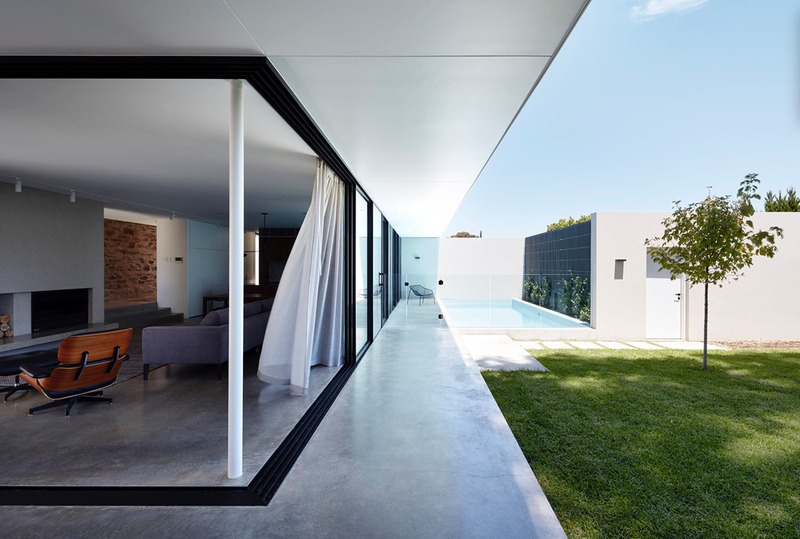 Large floor-to-ceiling windows generate transparency and openness between interior and exterior, unclosing a full view to the pool and garden while at the same time separating the two spaces. 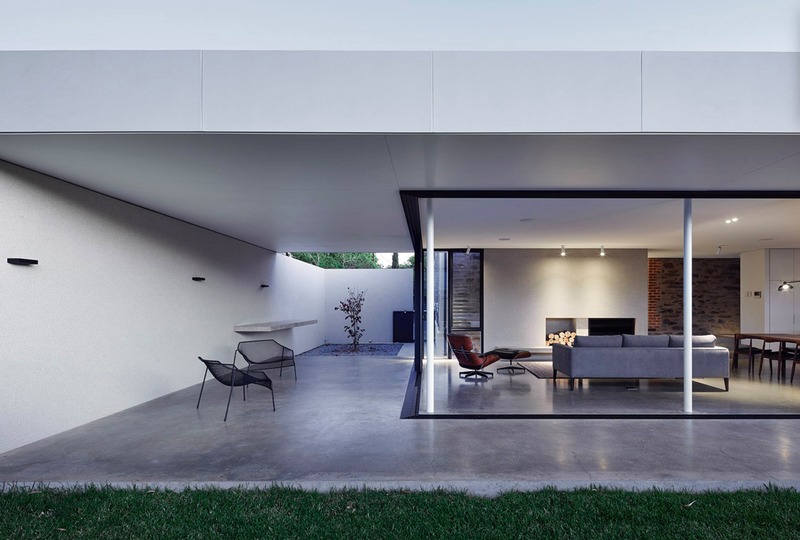 The architects’ decision to use the same modern grey flooring for inside and out has a cohesive overall effect and is revealing of their respect toward modernist principles – a strong connection to the outdoors is in full effect. 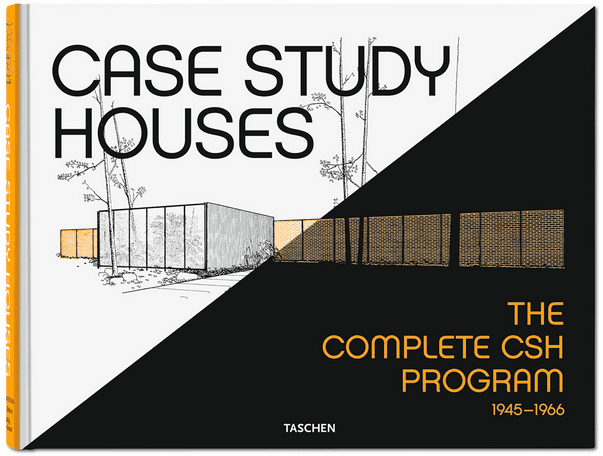 More telltales of modernist principles can be found in the elegant simplicity of the home. The interior decor is modest yet classy and functional. The open-plan design makes for a cosy living room and kitchen area for entertaining guests or a quiet night in with the family. 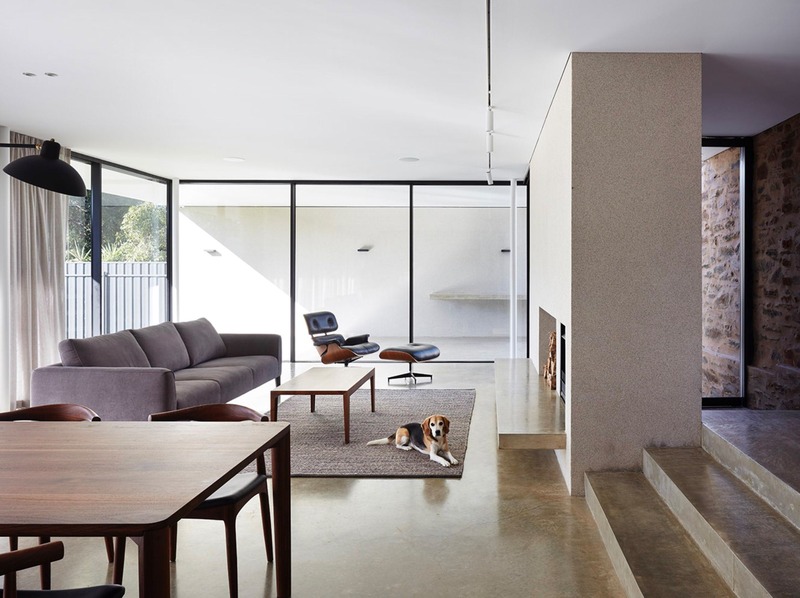 A large wall directs the focus from the living room couch to an inbuilt fireplace for those comfortable nights in. 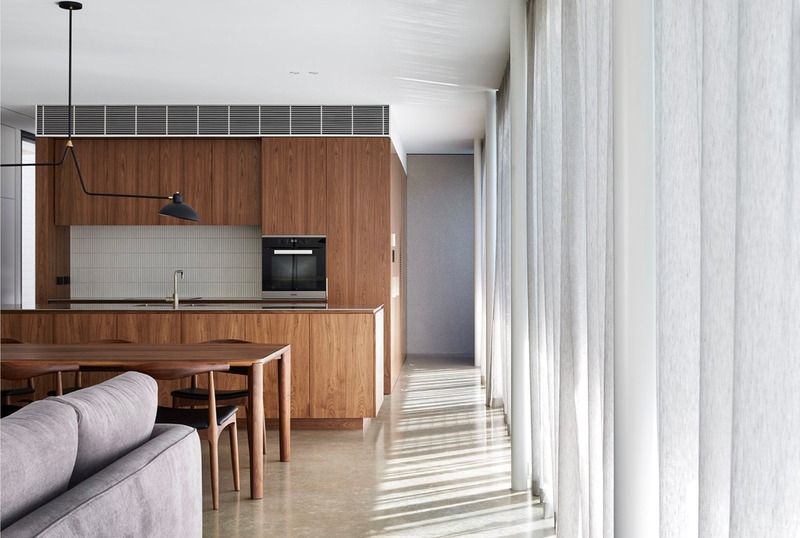 On the kitchen side, American walnut timber dominates the otherwise minimalistic vision. The wood has a natural effect, which is emphasized with the addition of a large wooden dining table between the kitchen area and where the living room begins. Clutter is kept to a bare minimum- a singular black modern design lamp hangs above the living room table. 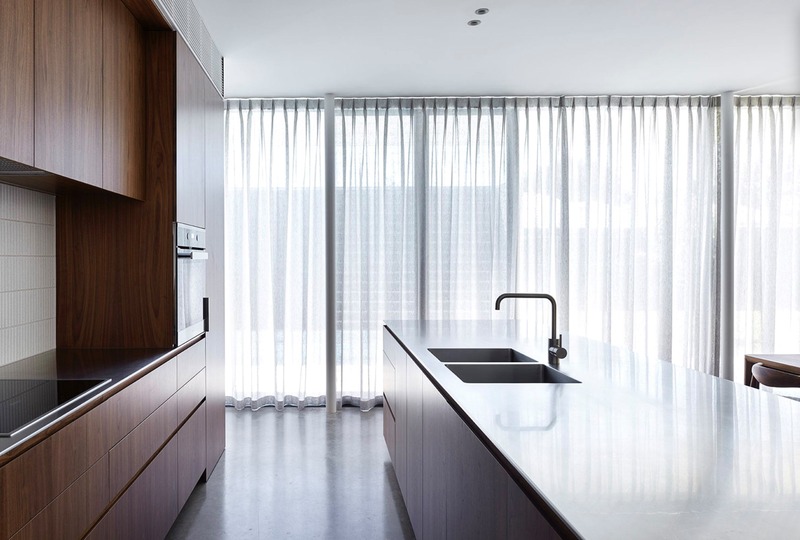 Seamless architectural materials are implemented in a number of areas. The bottom half of the bathroom uses textured white tiling in contrast to the black floor tiles, while the rest of the bathroom is kept to simpler white materials. Mirrored cupboards line up on top of the sink area, exposing the rest of the luminous bathroom. 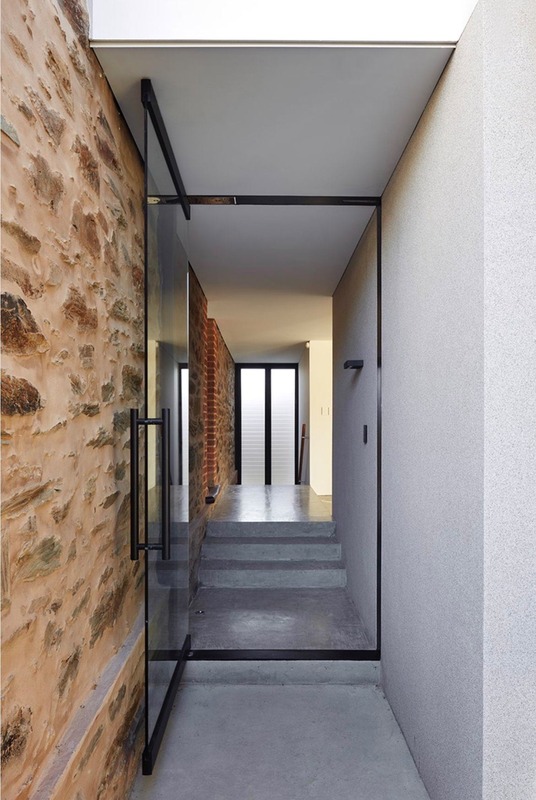 Victorian bluestone has become synonymous with cultural heritage in parts of Australia and it’s no easy task to successfully modernize a battered Victorian bluestone villa; the sensational refurbishing by Architects Ink won them an award at this years National Architecture Awards!